Usually when you hear a candidate or his supporters claim that the polls are wrong, it’s because they know they are losing. This is one reason why Trump has pivoted from talking about how great his poll numbers are to the “rigged election” theme. Could this be the first time that the majority of the polls are completely off? 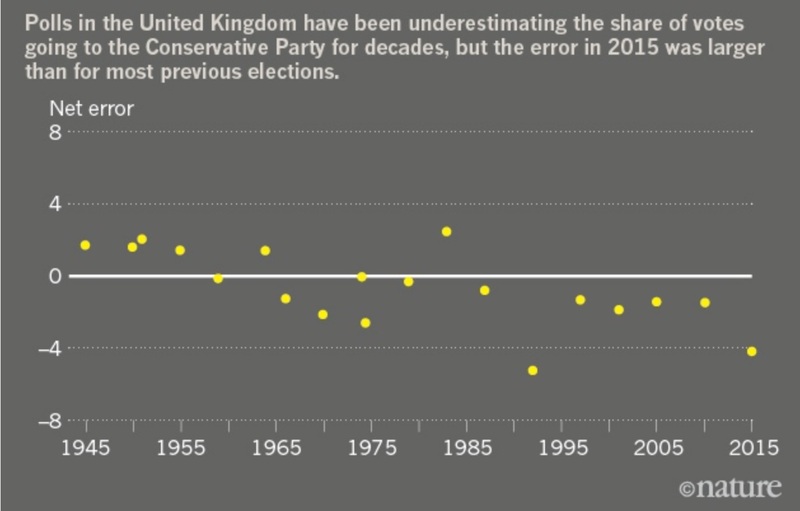 That’s what happened in Britain’s last general election, where the polls badly underestimated Conservative Party strength, which was attributed to “shy Tories.” (See charts below.) And the Brexit polls were wrong, too. Could there be a lot of “shy Trumpers” out there? 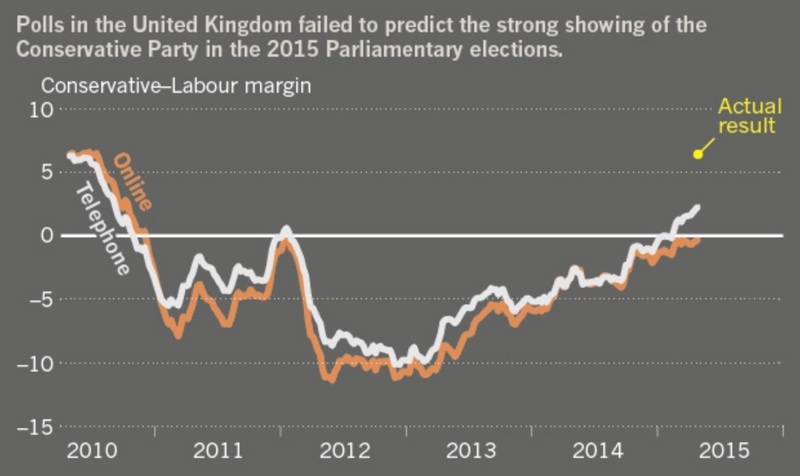 Maybe, but it’s worth pausing for a moment and understanding why polling is becoming so difficult and more volatile. Nature magazine, of all unlikely places, has a good article out this week about the methodological problems with polls. Among other things, the Nature article makes clear that most political polling, both here and in the UK, skew toward the left. Hence the calls for “unskewing” the polls are not fanciful. Hillary Clinton is heading for a landslide victory over Donald Trump. But wait. Trump is pulling ahead and could take the White House. No, Clinton has a clear lead and is gaining ground. Nearly every day, a new poll comes out touting a different result, leaving voters wondering what to believe. . . So the pollsters are fighting back. They are fine-tuning their efforts in reaching mobile phones, using statistical tools to correct for biases and turning to online surveys. . .
“Polling is an art, but it’s largely a scientific endeavour,” says Michael Link, president and chief executive of Abt SRBI polling firm in New York City and former president of the American Association for Public Opinion Research. . . In the 2015 UK general election, most major pollsters, including ICM Unlimited and YouGov, underestimated the turnout of older, Conservative Party voters, according to an inquiry published in March by the British Polling Council and Market Research Society1. The inquiry also found that pollsters have systematic biases in their samples. They tend to have too many Labour supporters at the expense of Conservative ones. They had applied weighting and adjustment procedures to the raw data, but this has not mitigated the bias problem. Another source of error identified in the report is “herding” — when pollsters consciously or unconsciously adjust their polls so that their results seem similar to those released earlier, causing the polls to converge. The bias in favour of left-leaning parties is not unique to the United Kingdom. The inquiry analysed more than 30,000 polls from 45 countries and found a similar, although smaller, bias. The report did not give an explanation for why, but some pollsters in the United States and Britain attribute the trend to inaccurate predictions of who will turn up to vote. . .
A variation on this is the ‘shy Tory effect’, named after Conservative-leaning voters in the United Kingdom who hide their views or misreport their intentions to pollsters. That makes some experts wonder whether a shy Trump effect might come into play in the forthcoming US election — in which a fraction of voters are embarrassed about or reluctant to admit their support for Trump or opposition to Clinton. But most major pollsters doubt that this will be a major factor because polls before the Republican primary elections gauged support for Trump accurately and he has performed similarly in online polls and in ones that use live interviews. Stay tuned. My expectation is that Trump will close strong, and the race will be closer than the current Oval Office drape measurers think.